“To those who look forward to a smile, a snicker and a little laugh on Sunday mornings I apologize, we will not be able to give that to you this morning. Instead, we offer up warmth, moist eyes and a glow in your soul as I just cannot let Veterans Day drift off into the darkness for another year, not yet. I cannot do it today, of all days, where spoiled, privileged, do-nothing ingrates take to a field to play a game we played as children and disrespect those who gave their lives so that they can make 30 times the annual salary of average Americans, just can’t do it. Wrong place, wrong message, wrong audience…just plain wrong. So today we offer a prayer that was given by a true American; one that pushes us forward to save the spirit of America and the National icons that we hold dear. It is our duty, our mission and our obligation to give our all to save the last of our wild horses and burros for future generations to experience, to enjoy and to love. 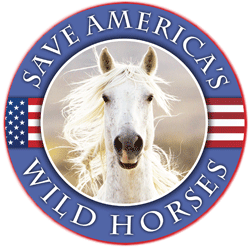 For the sake of those who died to keep us free, we work with earnest to keep free the wild horses and burros of the United States of America, it is our calling. God Bless.” ~ R.T.
BLM: Let the Carnage Begin!